Eileen Fisher + Boyer New York = A New Look I Love! Hi everyone, I hope you enjoyed your Easter, Passover, or simply Spring weekend! As I wrote here on Saturday, I am battling an injury and a sinus infection…but it will not keep me from smiling! I guess it is okay to give myself a treat…right? 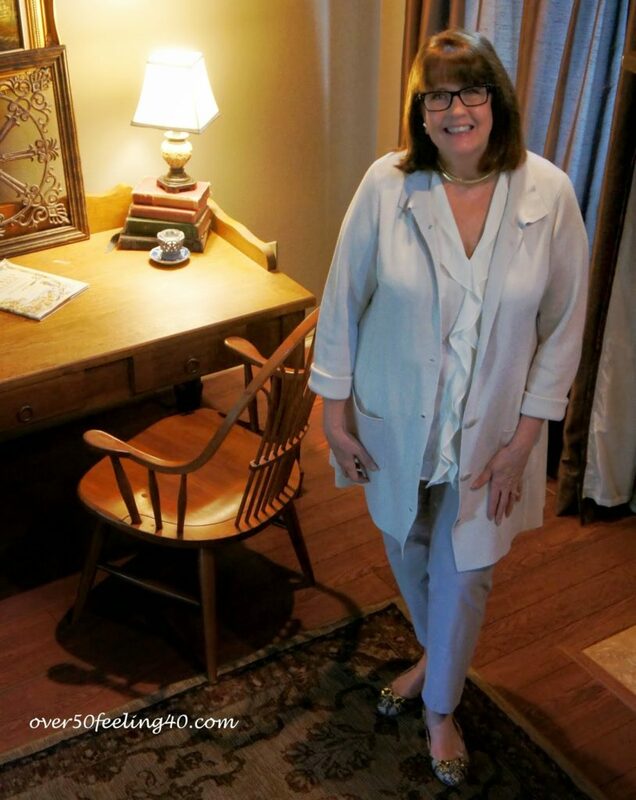 I fell in love with this EILEEEN FISHER BONE SILK AND COTTON JACKET when I first saw it….so, when the sale price hit, I gave in! The EF CREPE PANTS were purchased last summer in Chicago at the Eileen Fisher location in WATER TOWER PLACE!  Eileen Fisher collections are perfect for women of a certain age…beautiful and easy. I am beginning to budget now for quality pieces in my wardrobe…especially since some of the basics are done. If I plan right, I can pick up an item every now and then like this jacket. 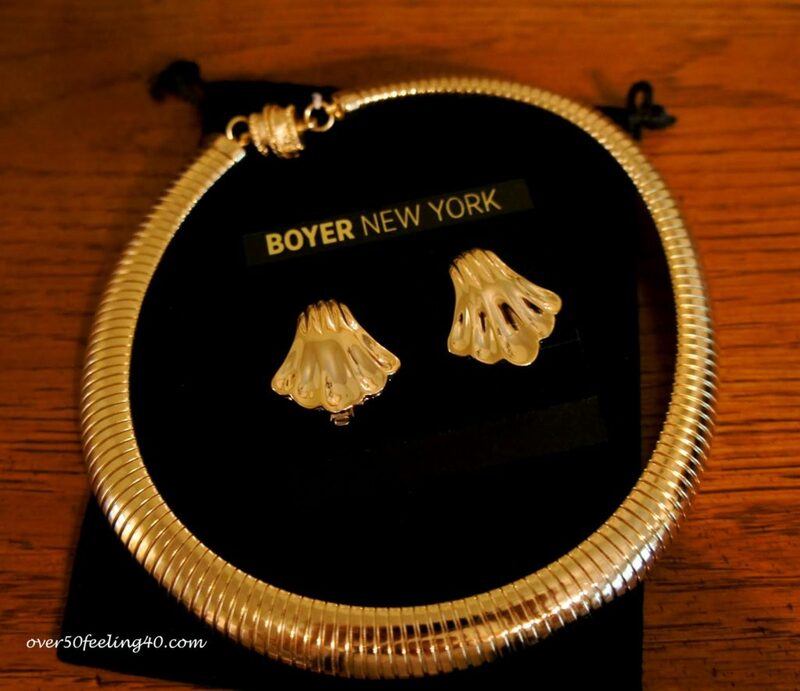 Another line perfect for our age group, is the gorgeous jewelry from BOYER NY. They sent me the COBRA NECKLACE with the magnetic, easy clip and the ART DECO CLIP ON EARRINGS….very comfortable for those who need a clip on! I know I will wear both of these often! I have one earlobe which is about to sag too much for my other earrings. This would be a good line to shop for Mother’s Day gifts…and I wore them all day at work with no discomfort and lots of compliments! Now, through April 30, you can receive a 20% discount when you order…just type FRIEND in the code box at checkout! Thanks Boyer New York! I may be a little sickly…but still smiling! How is everyone else doing? Have your avoided Spring allergies….BTW, thank you for all of the sweet comments about my hip injury…hopefully, I will keep plugging on! Happy Monday, all! 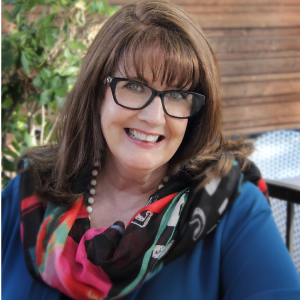 Now, please go visit the fabulous bloggers of VISIBLE MONDAY!! and MONDAY MINGLE!! I'm sorry to hear of your injury and sinmus trouble but so glad they don't affect your beautiful smile! I love these soft colours and fluid lines, it's a very elegant and easy chic look. Sorry you've been sick, Pam – hope you're much better any minute now. Love your new ivory jacket, you look wonderful. Thanks for sharing with Visible Monday. Love, love, love you positive attitude! But, I am sorry to hear you're not feeling so well. And, yes, it's okay to give yourself a treat, especailly one as beautiful as this slik and cotton jacket. Hope you start feeling better, but in the mean time, keep on smiling. I'm sorry you hurt yourself, Pam! I understand all too well having to work around limitations so I hope you're back to 100% very soon.Like you, I'm budgeting (and asking for) a few quality pieces rather than just owning a ton of so-so clothes. I love the clip-on earrings! Those are always hard to find. Oh no Pam,what happened to your hip,did you fall? Lots of prayer on its way to you! I love Eileen Fisher!, and you look fabulous! It sounds like you're battling challenging times with a great attitude, and EF! (I love EF, and love that they're doing a green line now as well. And, for the petite woman, it's nice to have their classic, quality, simple options. So versatile. And you look wonderful. Love this ensemble! You look fantastic in those soft colors Pam. The jewelry set looks amazing! Wishing you a speedy recovery! Hope you feel better soon. Remember it is better to look good, than feel good. 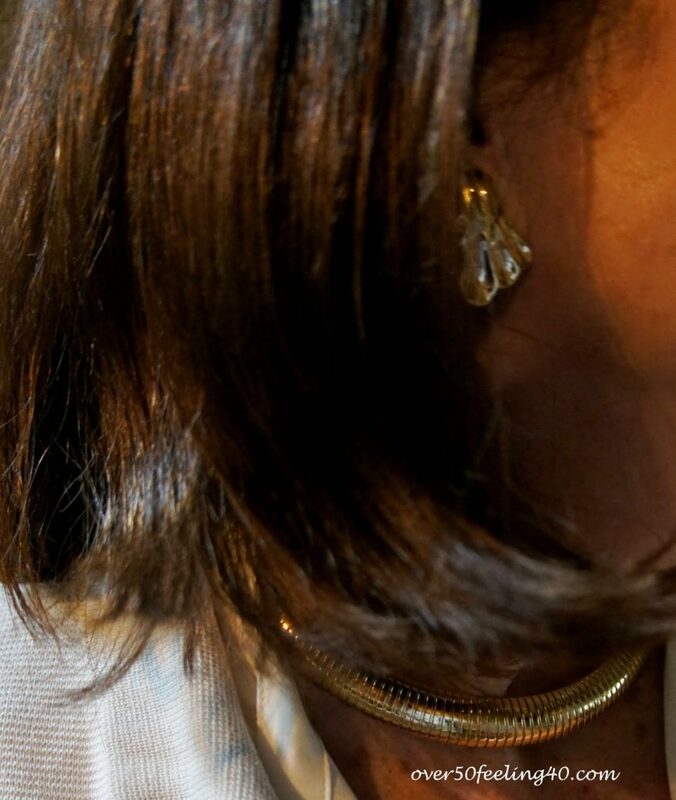 I'm swooning over that necklace! Good to hear you won't give in but keep smiling! And you look great, Pam. The jacket goes so well with the ruffles (l love wearing them too) and your jewellery is exactly my style – love it! You really can't go wrong with Eileen Fisher, her pieces have a timeless appeal. I've been a big fan for years! Eileen Fisher. Oh yes! Sales are a must. I have several really great pieces that are always in tyle. You look wonderful, get well soon! Hope you feel better soon! I love it when people smile on their blogs! I like your jacket and especially the jewelry, you know I am fond of jewelry! I hope you feel better soon!!! The new jacket is gorgeous and so fresh for spring!!! Love that jacket! And the outfit. But you know what else I really noticed? The shoes! Love those shoes! 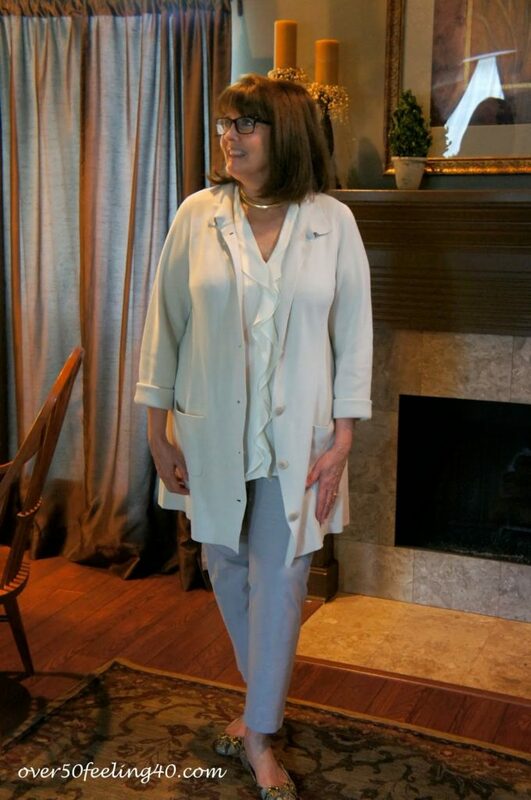 I'm really loving your Eileen Fisher linen jacket and your skinny pants – the look is fabulous! I have ONE piece of EF…I know what you mean about saving up for quality pieces…it's totally worth it when you love the look and the versatility! So sorry about your injury…I have also been healing from a broken foot for the past couple of months…it sure takes time…but a good attitude is priceless! I'm so glad women our age are adopting pale neutrals … as you do, especially with this fabric mix. Very springy and cheerily modern. But I'm sorry you're having what we call "sinus and snoot" problems. Get well very soon, 'cause you need to be out and about in this outfit! I saw that jacket in the store, gorgeous on the hanger even better on you. Hope you heal quickly, long term pain is no fun. 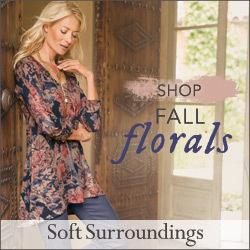 Very pretty..love the soft colors for Spring…thanks for linking up with Monday Mingle!